Torso pitch: -30° to +50° while standing. -30° to +60° while crouching. The Black Lanner is a fast medium OmniMech built by the Clans, excelling at harassment and scouting. The MASC equipment is built into the design and all units possess it. Being quite fast and sporting a diverse array of weapons, the Prime version is a great harasser unit, damaging enemies from long range with the LRM10 and the ER Large Beam Laser, but also able to somewhat defend itself at shorter distances with twin ER Medium Beam Lasers and the SRM6. Its a proficient scout, with a GECM suite that makes detection difficult and, like all Black Lanners, a MASC for quick tactical repositioning. The best harasser among the Black Lanner variants, it has long range, and it can use its speed to perform hit-and-run tactics. Its equipped with a cERPPC amd twin cLRM5s. Two extended range medium beam lasers can be used for short-range defense and medium to long range attacking, 7 Double Heatsinks help to keep some of the heat in check. In packs or along with other similar-equipped 'Mechs it can cause serious damage. This is the energy focused, aptly named "SunnyD" Lanner that wants to come close and personal. The combination of the Heavy Medium Laser, ATM 6 High Explosive and six Heavy Small Lasers can dish out amazing damage, although at the expense of heavy heat, which the 6 Double Heat Sinks have difficulty dealing with. It also cannot engage at long range, needing to search for cover when facing long range units. It sports a C3 unit, allowing it to operate as a forward scout for missile boats and other allied units. One of the favorite tactics used by the SunnyD's pilots is to dash into combat at top speed, deliver a massive alphastrike on an unsuspecting opponent and sprint back into cover while the weapons recharge. A well-rounded support-skirmisher, it can deploy the ultra-autocanon 5 at long ranges, and then use its impressive speed to close in and finish the opposition with the quad Extended Range Small Beam Laser battery and the Dual Streak SRM4. An AECM provides nearby teammates with ECM support and disables enemy NARC missiles. The Black Lanner C really shines when supporting its team as it doesn't have the outright punch on its own. The ultimate drive-by support mech. The tip of the spear is the cNARC launcher, allowing allied missile boats to engage out of the enemy line of fire, making this Black Lanner an important support asset. Offensively, it mounts a single cLRM10, 3 cSPLs, and a single cLPL, giving it a moderate amount of firepower. Although it can intercept and run down most mechs, it can't dish out enough damage in a prolonged combat. Pilots are urged to use the extra ton of ammo for the NARC launcher. Newly remodeled, the Black Lanner E variant now mounts a good one-two ultra long range punch with twin ATM3 extended range and the HAG20, reaching over 1200m. When caught in close range, it can utilize MASC to break distance, and resume long range offensive operations. Four Machine guns give the mech some anti-Battlearmor and anti-aircraft utility. The E variant also fully uses EOptics, allowing for greater accuracy at long ranges. Operating at medium range, the Black Lanner F is able to bring a Ultra Autocannon 10 and twin heavy medium lasers. 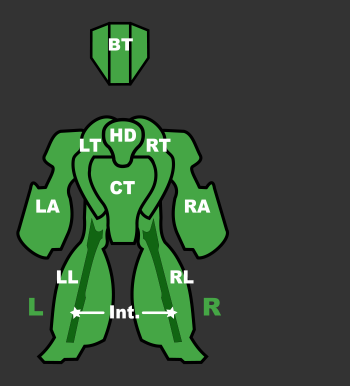 At close range, a single SRM4 launcher can help dispatch battlearmor with its splash damage. Being the least expensive Black Lanner, it does best when keeping its opponents at medium range, maximizing its survival chance by being a more difficult target to hit due to its high speed. 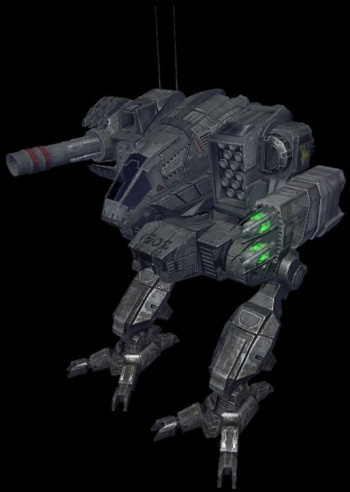 A stand-off Mech utilising almost exclusively longe range weaponry, the Black Lanner G is a support/scout hybrid. It is equally comfortable ferreting out non hidden enemy units with its C3 computer and sharing the data, as it is with guiding in missiles from allied units or launching them itself, utilizing the TAG and twin LRM launchers, a CLRM15 and a CLRM10 mounted on the chassis. Further long range enemy harassment is done by its extended range large beam laser and triple machine guns. The Black Lanner is a fast medium OmniMech that can take on a variety of roles. It first saw action during the Trials in the run up to the Clan Invasion, but the Inner Sphere first saw it during the Battle of Tukayyid. The front-line 'Mech makes use of all weight-saving technology available to the Clan Jade Falcon scientists who used it, including an XL Engine, Endo Steel, and eight tons of Ferro-Fibrous armor. The Black Lanner includes a MASC system on the base chassis that enables it to run up to 151 km/h in bursts. This page was last edited on 29 January 2019, at 14:20.